Oil palms need all sorts of nutrients in their daily lives in order to grow and produce fruit. One of these nutrients that are extremely important is Boron. 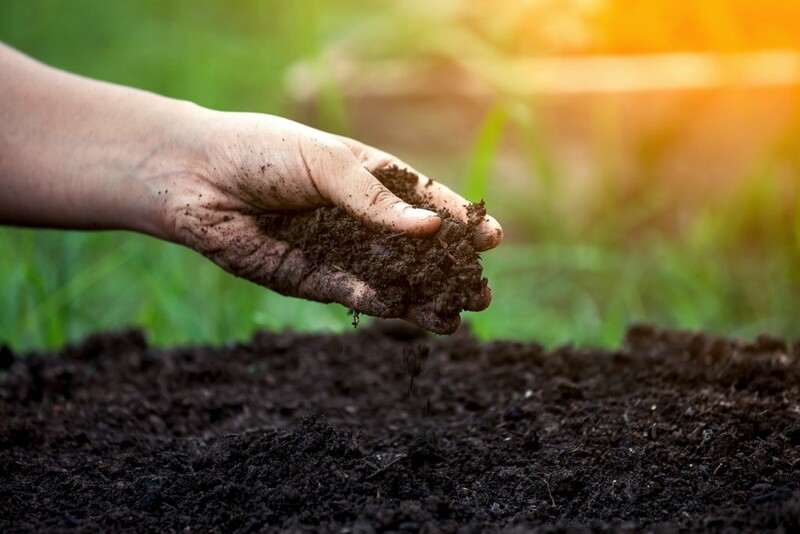 In order to maintain the levels of Boron in soil, Borate fertilizers are often used. Borate fertilizers are also known as Calcined Ulexite and we at Everchem have our very own brand, the Daebak Borate fertilizer. This fertilizer is designed with you in mind. We have invested years of research and development to bring you a fertilizer that suits your needs completely. 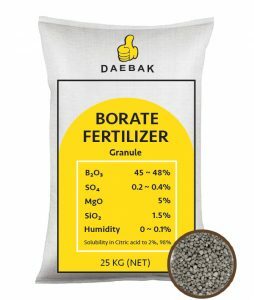 The Daebak Borate fertilizer comes in two forms, powder and granules. 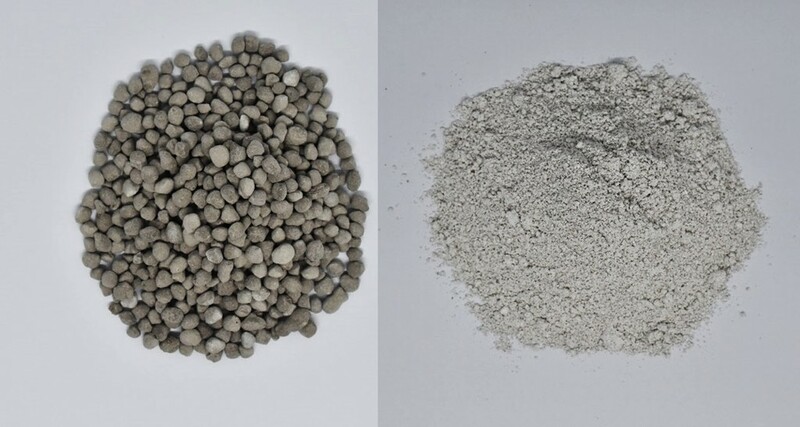 Both are light grey in color and have a high level of bio-availability for roots. Both these forms are easy to handle and disperse, both manually and by machine. They are also designed to have minimal runoff and stay within the soil in order to enrich the palms. Boron deficiency is more prominent in coastal plantations where there is lower organic matter and the soil is sandy with a high humidity. Additionally, soils that are slightly alkaline will have a lower availability of Boron too. In cases like this, you’ll need a fertilizer that can be soluble enough to reach the oil palm roots and Daebak Borate fertilizer can do just that. Boron is necessary for the movement of Calcium in making strong plant cell walls. It is therefore needed in the division of cells as the root tips, leaf pinnacles and bud development. 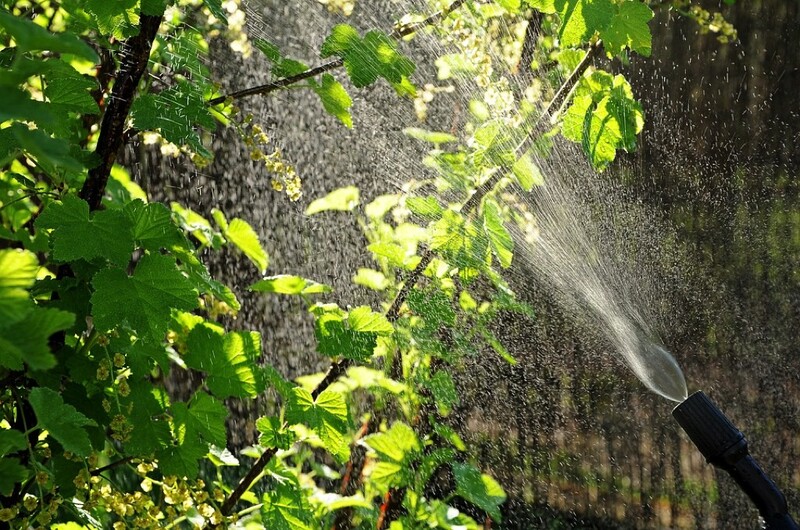 Without Boron, there is a high possibility that your trees may be stunted in growth. Daebak Borate fertilizer provides the Boron needed by your oil palms to grow big, strong and steady. Boron is a key element in the balance of sugar and carbohydrates in oil palms and is necessary for the plant to form fruits rich in oil. If you want your palms to produce better fruits, make sure that they’re not short on Boron. Since Daebak Borate fertilizer is also available in powder form, this makes them suitable to be turned into a liquid suspension. In this liquid form they can be applied to the leaves in addition to the soil. Certain studies have found that Boron is absorbed more efficiently by the leaves. This means that you have more options when applying our Borate fertilizer. Daebak Borate fertilizer is made from the best Calcite Ulexite minerals that are found naturally in as salts in the earth. They are processed with no harmful additives, so what you get is a naturally occurring mineral that is completely safe for you and your oil palms. They’re also completely safe for the soil when applied at the correct rates and amounts. 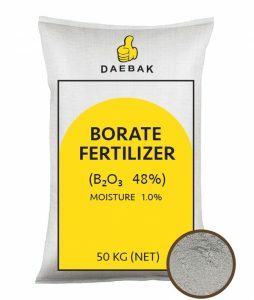 Give Daebak Borate fertilizers a try today and see it completely transform your plantation into a thriving one that’s healthy and sustainable for the long term.